Oyakuen Garden (御薬園) is Japanese Style Garden in Aizu-Wakamatsu. Originally, it was founded by Ashina Morihisa in Muromachi period. He found the sacred spring here and built a garden. When Matsudaira clan moved to Aizu, they rebuilt a garden. Current design of Oyakuen was built in 1696. Today, it is popular flower spots in Aizu. Admission: 310 yen for adult, 260 yen for high school, 150 for under high school. There is a group discount from 30 people. 1. use local bus to Oyakuenmae. Oyakuen was named by Hoshina Masatsune, the 2nd lord of Aizu domain. He used this garden for drug plant husbandry. "Oyaku" literary means a medical herb. The 3rd lord, Masaata, invited Meguro, the famous gardener, and ask him to built Enshu style Japanese garden. 1670 the drug plant husbandry was made by Hoshina. 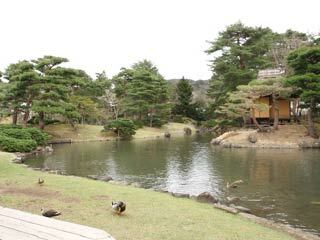 1696 the garden was built by Matsudaira. 1932 registered as great view. These houses were used as the hospital of the new government army during Boshin War in 1868. Therefore, they survived from the battle. There are many traces, such as sword-traces.